Mix Streusel Topping ingredients together. Sprinkle on top of muffins. Adapted from 500 Best Muffin Recipes. 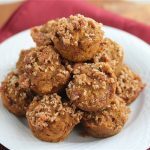 To make this muffin recipe healthier, I used whole wheat flour and raw coconut sugar in place of white flour and white sugar. If you're new to whole grain flours, try using half white flour, and half white whole wheat flour first. I cut the oil in half by substituting apple butter. The streusel topping is completely optional. This recipe is gluten-free adaptable; simply substitute your favorite gluten-free whole grain baking mix for the flour.